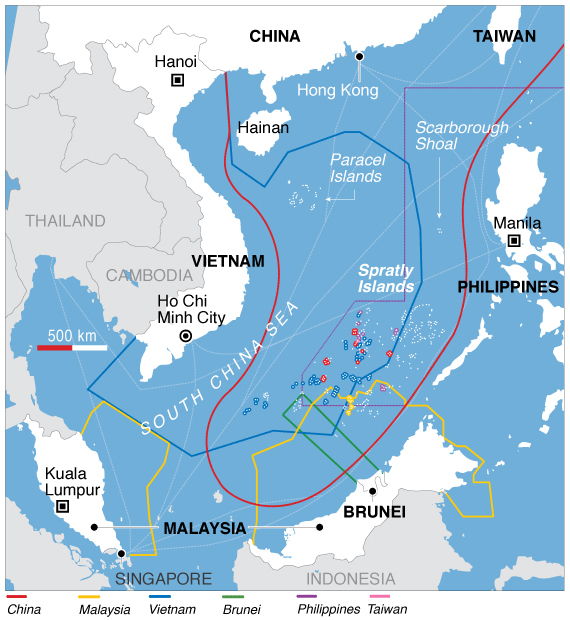 One of the most significant – and increasingly bitter – international disputes of recent years has engaged legal claims over maritime territory in the South China Sea. Under the United Nations Convention on the Law of the Sea of 1982 (UNCLOS), to which the main protagonists are parties, states are entitled to claim an Exclusive Economic Zone (EEZ) conferring sovereign rights and jurisdiction up to 200 nautical miles of maritime space from their coasts. In the South China Sea, however, this position has been complicated by historical claims over a series of small islands and reefs within the southern section of this area. To this end, China has contentiously drawn the so-called “Nine Dash Line”, a large tongue-shaped area extending considerably beyond the 200-mile limit, in which it claims historical sovereignty over more than 90% of the South China Sea, including many of its reefs and islands. This has brought China into direct conflict with a number of its neighbouring states in this region, with the Philippines, Vietnam, Malaysia, Brunei and Taiwan also laying claim to these waters. Map of the competing territorial claims in the South China Sea. Source: Wikimedia Commons. Meanwhile, widespread environmental concerns have been raised by an extensive programme of land reclamation conducted by China within the sensitive marine ecosystem of the South China Sea, building a series of larger islands around a series of reefs with the intention of reinforcing ownership of these areas and generating additional EEZs around a number of the resulting “islands”. Wider security controls have been raised by an increasing degree of Chinese militarisation of these waters, as well as allegations of intimidation of Filipino fishermen seeking to exercise traditional fishing rights. Against this increasingly complicated backdrop, in 2013 the Philippines initiated a process of arbitration against China, seeking clarification of the legal entitlements of both states within the South China Sea, as well as a ruling as to whether the contested rocks and reefs could qualify legally as “islands”. On Tuesday, in a highly extensive award, an international tribunal in The Hague ruled in favour of the Philippines, rejecting China’s claim of historical title over these waters and finding that many of the terrestrial features within the disputed area failed to meet the legal definition of an island. Moreover, the panel ruled that China had unlawfully prevented the exercise of traditional fishing rights in particular locations, while also conducting fishing within areas under Filipino jurisdiction without permission. The tribunal also held that Chinese fishermen had harvested endangered species, such as sea turtles, coral, and giant clams, on a “significant scale” and, with the toleration of the Chinese authorities, had conducted activities that were highly destructive to the coral reef ecosystem. Perhaps most significantly, however, the panel further considered that China had breached its obligations concerning the marine environment under UNCLOS in conducting unauthorised land reclamation projects around many of the reefs and islands, which it declared to have caused “severe, irreparable harm” to the ecosystem. The South China Sea is a relatively small area of the world’s oceans, at 3.8 million square kilometers, but it has great economic and ecological significance. The area is bordered by 12 countries and territories and is home to two billion people, incorporating some of the world’s fastest growing economies. It is also one of the five most productive fishing zones in the world, providing some 12% of the global fishing catch. The South China Sea is biologically diverse, providing habitat for at least 3,365 known species of marine fishes. 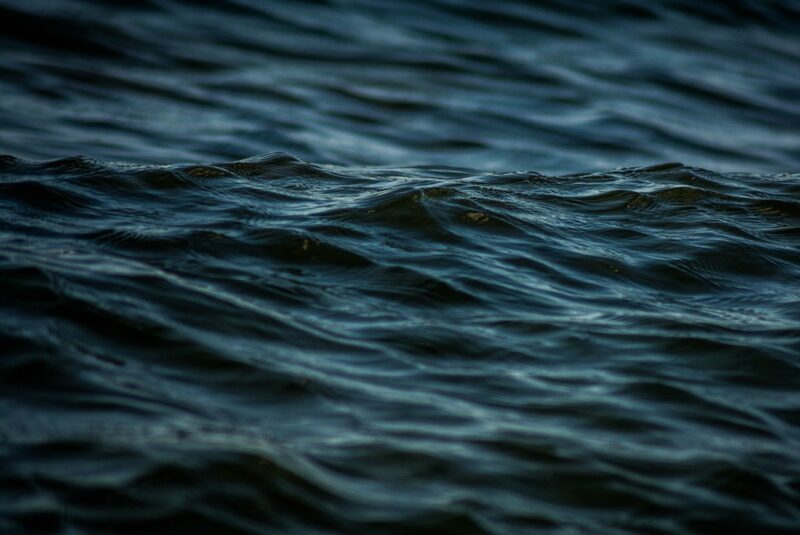 Given its richness in resources and biodiversity and its strategic location, the sea is a crucial element for coastal livelihoods and local economies. At least 3.7 million people are estimated to be employed in the fishing industry in this area, though the true figure is likely to be considerably larger given the high rates of small scale and unreported fishing. In addition, a recent studyhas indicated that many countries bordering the South China Sea are amongst those most reliant on fish as a food source and, thereby, vulnerable to micronutrient malnutrition. A 2015 report by OceanCanada Director Rashid Sumaila and Nereus Director of Science William Cheung, “Boom or bust: The future of fish in the South China Sea”, found that overfishing and habitat destruction has become a substantial problem in this region, with species fished to 5-30% of their levels in the 1950s. The use of intensive commercial trawl fishing for a number of decades — the pulling of nets behind boats resulting in catches of a variety of species — combined with an intensification of fishing effort over the past thirty years has led to the overexploitation of these fisheries. Other destructive fishing practices have included the use of dynamite and cyanide on reefs, conduct that was condemned by the arbitral panel. As a result of these activities, the coral reefs of the South China Sea have been declining at a rate of 16% per decade. The wider ecosystem has also suffered the effects of pollution from agriculture and coastal development. In addition, marine biodiversity and fisheries in the region are acutely vulnerable to the adverse impacts of climate change and ocean acidification. The report’s authors found that by 2045, under a “business as usual” scenario for fishing and climate change, each of the species groups studied would decrease by 9 to 59%. Of greatest concern, those more vulnerable to the impacts of fishing, such as groupers, large sharks, threadfin breams, and large croakers were projected to decline by 50% or more. The authors found that only a 50-60% reduction in fishing effort would allow the beleaguered stocks of the South China Sea to recover. 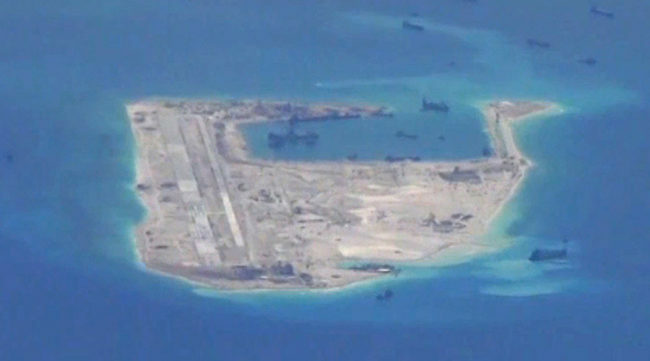 Fiery Cross Reef -- an artificial island created by China in the South China Sea. Source: Wikimedia Commons. The South China Sea Arbitration was conducted in a climate of escalating regional tensions and a trend of increasing unilateralism on the part of the main power in the region. Indeed, China steadfastly refused to recognise the jurisdiction of the arbitral panel and declined to formally participate in the proceedings, while expanding its land reclamation projects significantly as the tribunal deliberated. Official statements from Beijing have remained bullish, notwithstanding the tribunal’s damning verdict on Chinese conduct, indicating that the award will do little to alter official policy in these waters. China has indicated that, rather than accepting the ruling as to the legality of its claim over this area, it may seek to bolster its security presence – a move that is likely to draw the ire of global actors that are considerably more powerful than its regional neighbours. Indeed, restrictions over marine navigation and overflight have already been challenged by the United States and this is likely to constitute a significant issue in future Sino-American relations. 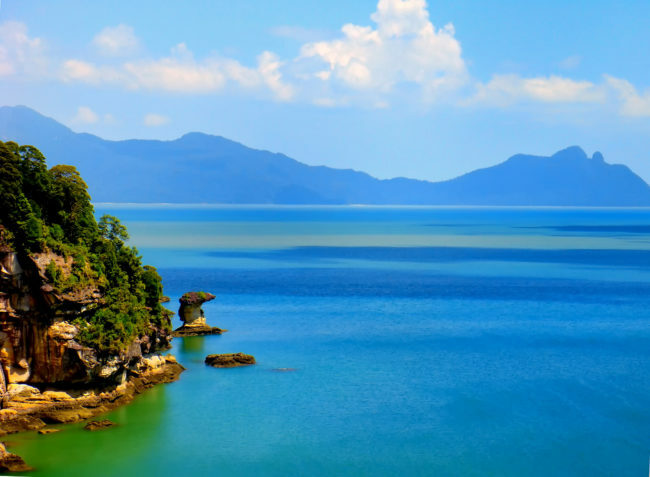 Security considerations and the rejection of the ruling by China nonetheless has significant implications for the restoration and management of the ecosystems and fisheries resources of the region, caused in significant part by Chinese assertions of sovereignty in these waters. Substantial difficulties seemingly lie ahead, not least concerning the enforcement of and compliance with laws and regulations in the South China Sea. With China having rejected the tribunal’s central finding that a significant proportion of these areas belong to the Philippines, similar regulatory clashes appear likely to continue, while simultaneously rendering co-management of the resources ever more difficult. If this instability continues, the keenest impacts will be likely faced by fishers and coastal communities, who will have to run the gauntlet of security conflicts in these waters, while also facing resource challenges posed by the depletion of fisheries resources and damage to wider ecosystems. The South China Sea is rich in resources and biodiversity, making it crucial for coastal livelihoods and local economies. Credit: "South China Sea, Sarawak" by Rod Waddington. Immediate action will be required to conserve the ecosystem and its resources. Various proposals have been tentatively made as to how to mitigate these ongoing environmental problems. One possibility, given the potential significance of coral reefs in the disputed area, could be the development of an international Marine Protected Area, as has been previously advocated for by scientists to conserve both the valuable natural resources of the region, as well as coral reefs in surrounding areas. This has the advantage of withdrawing the area from general use by all parties, although it remains questionable whether such zealously guarded territorial claims can be convincingly relinquished in favour of the promotion of marine reserves. Another general suggestion is to attempt to separate resource and environmental management discussions from the vexed question of jurisdiction, although practice in other disputed marine areas suggests that this may be no simple task in practice, especially given the value of these resources – a factor that proved to be a core driver of assertions of sovereignty over the South China Sea in the first instance. Ultimately a speedy resolution of the dispute – an outcome that has remained a central tenet of the UNCLOS dispute settlement procedures since their inception, and indeed underpinned the need for the present arbitral award – would provide the conditions necessary to foster the development of effective management and conservation plans for these waters. The prevailing political climate nonetheless suggests that a solution to this issue is likely to be anything but swift in reality. Given the harrowing evidence of marine environmental harm presented during the course of the proceedings, and detailed further by the tribunal itself, this position is likely to operate to the significant long-term detriment of the South China Sea, given that management and conservation actions are needed to reverse the adverse trends facing biodiversity and fisheries resources in this region as a matter of urgency.